“Visual thinking” - Test smarter & faster - Clean Software. Guaranteed. It is interesting that in the current technology/tool infested world, we have realised that human mind is the most powerful after all, and engaging it fully can solve the most complicated problems rapidly. One of the key ingredients of an engaged thinker is “Thinking visually” ; to clearly see the problem, solution or gaps. Design Thinking relies on sketching/drawing skills to imagine better ideas, figure out things, explain and give instructions. Daniel Ling(1) in his book “Completing design thinking guide for successful professionals” outlines this as one of the five mindsets – “Believe you can draw”. Sunni Brown(2) in her book “The Doodle revolution” states “doodling is deep thinking in disguise – a simple, accessible and dynamite tool for innovating and solving the stickiest of problems“ by enabling a shift from habitual thinking pattern to cognitive breakthroughs. David Sibbet(3) a world leader in graphic facilitation and visual thinking for groups in his brilliant book “Visual Meetings” outlines three tools for effective meetings to transform group productivity : (a) ‘Draw’ to communicate visually (b) ‘Sticky notes’ to record little chunks of information and create storyboard (c) ‘Idea mapping’ which are visual metaphors embedded in graphic templates and worksheets to think visually. Dan Roam(4) in “Show and Tell” states that the three steps to create an extraordinary presentation are (a) Tell the truth (b) Tell it with a story and (c) Tell the story with pictures. The book ‘written’ beautifully in pictures entirely is about ‘how to understand audience, build a clear storyline, create effective visuals and channel your fear into fun’. Jake Knapp(5) in “Sprint – How to solve big problems and test new ideas in just five days” outlines a five-day process to problem solving relies on SKETCHING on Day 2. He says that “we are asking you to sketch because we are convinced it’s the faster and easiest way to transform abstract ideas into concrete solutions. Sketching allows every person to develop those concrete ideas while working alone”. 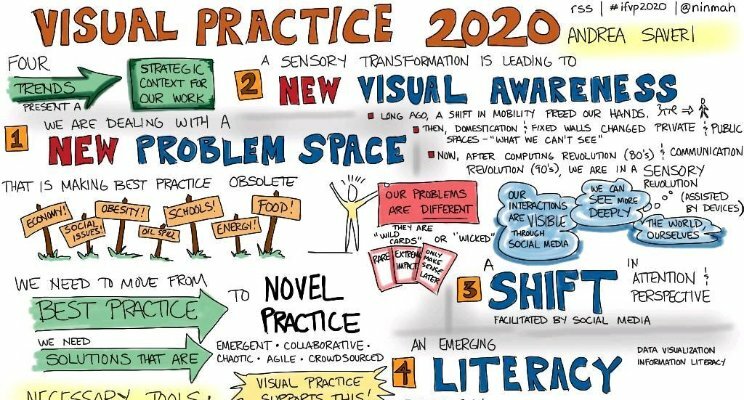 It is interesting to note that visual thinking has taken centre stage now with emphasis on sketching, drawing as a means to unleashing the power of the mind. As a keen practitioner of software testing, I am amazed how people get swooped into the thinking that automation is the solution to ensuring software quality. Indeed tools and automated testing practices enable continuous evaluation rapidly, but there is indeed no substitute for the power of smart thinking. Testing is a funny business where one has to be clairvoyant to see the unknown, to perceive what is missing and also assess comprehensively what is present ‘guaranteeing’ that nothing is amiss. To be able to do this very well, good visualisation is key. To see with stark clarity what is present, needed and missed out. Immersive Session Testing (IST) is a style of testing that exploits the logical left brain with the creative right, enabling you to immerse deeply and test in short sessions. Powered by HBT (Hypothesis Based Testing) that provides the scientific rigour and “Workspaces” equipping you the creative fluidity, it enables one to immerse, think logically, write less, do more with a sharp focus on outcome. The power of visual thinking in IST enables you see the big picture of the system and its full context of end users, use cases, environment and attributes, visualise the end user’s usage to empathise with them, get under the hood to extract conditions to model behaviour and design test cases, and finally visualise the quality of delivered system. IST enables old fashioned intelligent testing, by equipping you with modern thinking tools and paradigms which when combined with technology/tools makes testing smart, fun, fast, rich and value adding. Marketing blurb: If you are keen on adopting IST, a smart, scientific, rapid & modern approach to software testing, check out the one-day experiential workshop on Dec 9, 2016 by clicking here. (1) Daniel Ling “Completing design thinking guide for successful professionals”, CreateSpace Independent Publishing Platform, 2015. (2) Sunni Brown, The Doodle Revolution: Unlock the Power to Think Differently, Portfolio, 2014. (3) David Sibbet, “Visual Meetings: How Graphics, Sticky Notes and Idea Mapping Can Transform Group Productivity”, Wiley India Private Limited, 2012. (4) Dan Roam, “Show and Tell – How everybody can make extraordinary presentations” Penguin, 2014. (5) Jake Knapp, “Sprint – How to solve big problems and test new ideas in just five days”, Bantam Press, 2016.